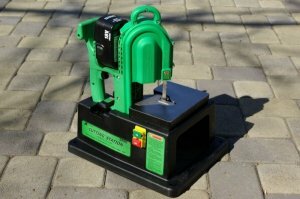 I recently had an opportunity to test out the Stout X-Band Saw and Cutting Station. Let me start out by say that the X-Band Saw is like no other saw on the market. How so? Well, you have the ability to use the saw as both a portable hand held band saw, and a small band saw station when using the available Cutting Station accessory. When you first pull the X-Band out of its case you realize how small it is. Hopefully the photo of the X-Band in hand can give you an idea of its size. It was designed to be comfortable during one handed operation, and probably 90% or more of my testing was done using the saw with only one hand. 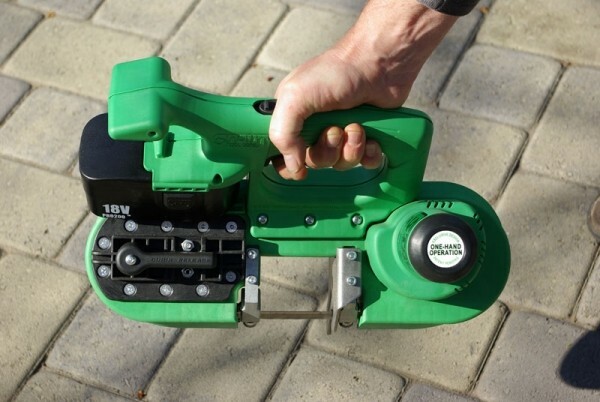 Sorry left handers, this saw, like most tools was designed for right handed people in mind. When used in the right hand, the offset of the blade from the handle makes the tool pretty well balanced, with a good line of sight to your material. You might think that because of its small size that it would be lacking in power, but I found it to work very well for cutting electrical conduit, as well as 1-inch galvanized pipe. 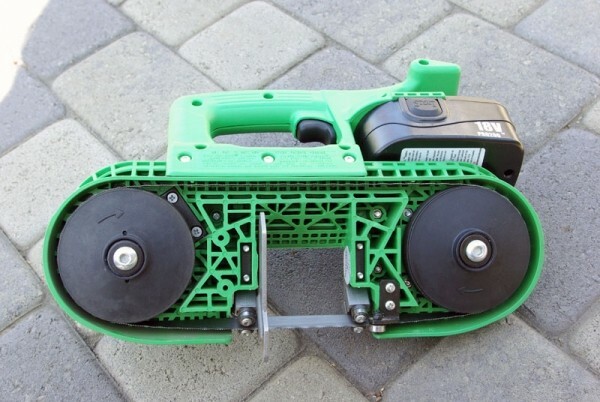 You are limited to cutting 2-1/2" material which is smaller then other portable band saws on the market, but the X-Band is a much smaller saw at a much lower price. I was able to get on average 38 cuts through 1-inch ID galvanized pipe before the battery needed a charge. The saw never seemed to struggle while making a cut, and I was cutting everything I could find.Before you use the X-Band, just like any other tool, you should read through the manual, and make sure you understand your tool. 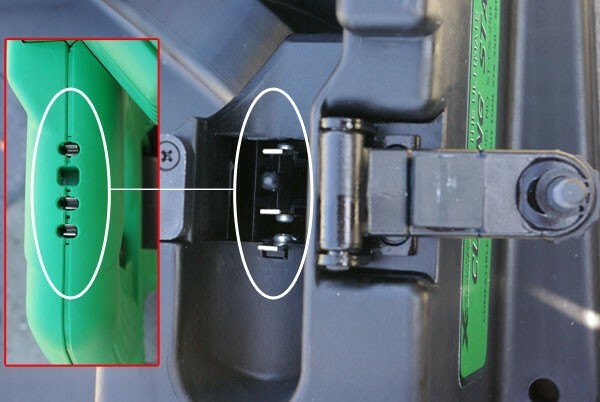 This is where I found out that the 18 volt 2Ah NiCad batteries need to be conditioned before use. I have had tools in the past that used NiCad batteries that did not need conditioning. I can only assume that those previous tool's batteries were pre-conditioned at the factory. The instructions state the batteries need to be charged 5 times before they reach their full potential. Don't expect to get this tool and use it right out of the box. After the initial charge I was only able to get a few cuts before it needed to be charged again. Make sure you get a couple charges out of the way before you really need it. While I never needed to change the blade, I did remove and reinstall it to see how easy it would be. It is pretty simple to change the blade once you know what you are doing. Just make sure the blade comes off the roller guides last when removing the blade, and on the guides first when installing the blade. You need to do it this way, because the guides twist the blade to make it parallel with the hand grip. The overall construction of the tool seemed to be good. It felt solid in my hands, and there was no rattling or movement during a simple shake test. The seam down the middle of the grip was a bit annoying because of the sharp edge, but could easily be fixed with a little sandpaper or some grip tape to cover it. I found the safety switch was awkward for me to use. It seemed like it was set too low on the handle, and would have been better placed on the left side of the handle where your thumb would naturally rest. Considering that you cant really use the saw with your left, it didn't need to be placed in the center of the tool. As mentioned above, the X-Band can also be used with the Cutting Station accessory. This is great if you have some hobbies or crafts to do and have a limited work space. It can also be used in the field as a stationary band saw. It uses a male plug that fits into the X-Band which allows you to use the on/off switch on the station instead of the one on the saw. The station also has a solid metal table which will not only give you a flat sturdy work surface, but will allow you to use Magswitch jigs if you need them. The station uses a screw clamp to attach the saw to the station, and also comes with a safety shroud to cover the moving parts. To be honest, I couldn't find many uses for the cutting station, but it is an option for those of you that need it. Overall I am very impressed by the X-Band. It beats cutting metal with a reciprocating saw any day of the week; unless the piece you want to cut is too big for the X-Band. I have had to cut tons of stainless steel closet pole as well as U channel in the past, and the X-Band would have saved me a ton of time without being overkill for the job. It costs around $130 on Amazon which includes one battery, and a storage bag. At that price, it is cheap enough even as a unitasker. I imagine the X-Band would be very useful for electricians, plumbers, or anyone else needing to make quick easy cuts with one hand.